Veins carry blood back to the heart. Your legs contain a network of veins. Superficial veins (near the surface of the skin) connect to perforating veins. Perforating veins carry blood from the superficial veins to the deep veins of the thigh and calf. Healthy leg veins contain valves that open and close to assist the return of blood back to the heart. Venous reflux disease develops when the valves that keep blood flowing from the legs back to the heart become damaged or diseased. This can cause blood to pool in your legs, which can lead to a progression of symptoms. Spider veins, medically known as telangietasias, are dilated capillary veins less than 2 mm in diameter. They are small blue to red appearing blood vessels that lie close to the surface of the skin and occur either in lines or web-like patterns. They are usually visible on the legs but sometimes are visible around the nose and lips and are commonly referred to as ‘broken veins’. While they can ache, burn or itch, now and then, they are usually not symptomatic. Spider veins are not harmful and are simply unsightly. 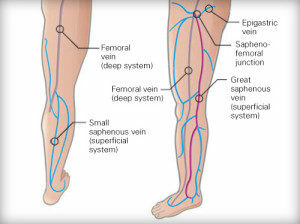 Varicose veins are rope-like blue vessels under the skin, usually ¼ inch or larger in diameter. They are most often branches from the saphenous trunk veins, and have enlarged due to the excess pressure in the saphenous system. Varicose veins are unsightly and often painful. A clotted varicose vein causes a condition called phlebitis, in which the skin overlying the site of the clot becomes hot, red and painful. Besides the visible symptoms, physical symptoms include tiredness, restless legs at night, heaviness in the leg, pain, aching, itching, throbbing and swelling, burning or a cramping sensation. Beyond the purely cosmetic concerns about spider veins and the pain, fatigue and discomfort that result from varicose veins, venous reflux is a progressive disease that can lead to other, more significant circulatory problems as it worsens. Swelling of the leg is a further sign that damaged or diseased vein valves are not functioning properly. Since the blood cannot be effectively returned to the heart, it pools in the leg resulting in higher than normal pressure (venous hypertension), and causes the leg to swell. This swelling is called oedema. In addition, when blood flow out of the legs through superficial and perforating veins is in adequate, this higher-than-normal pressure can result in damage to the skin. Progression of venous reflux can lead to changes in the skin’s color (hyperpigmentation) as well as changes in skin texture. The most severe stage of venous reflux disease is when the inadequate blood flow results in an ulcer, commonly near the ankle. In fact damaged or diseased perforating veins are the source of venous reflux in nearly two-thirds of venous ulcer patients.1 These ulcers are raw and painful wounds which may not always be healed using only antibiotics or salves. Our practice is experienced in offering the most progressive approaches in treating patients with advanced symptoms of venous reflux, including venous leg ulcers.